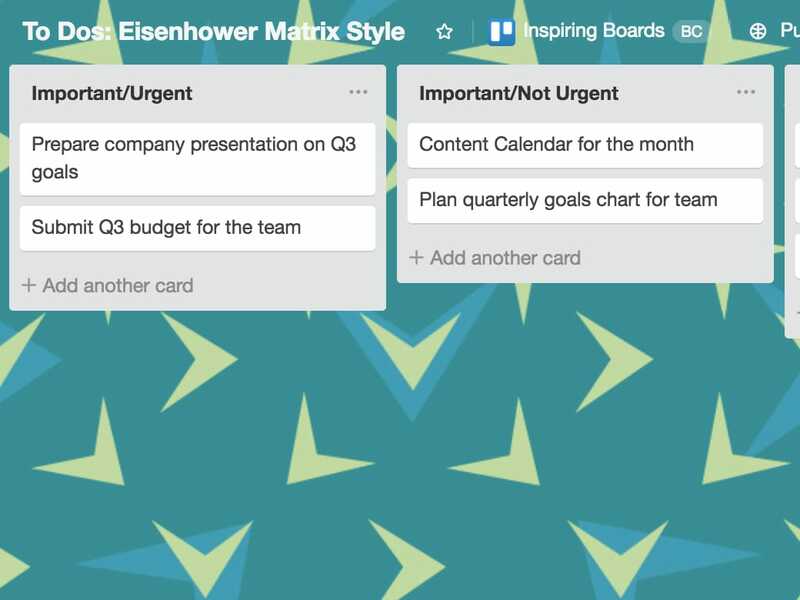 Developing a system for boosting personal productivity is no small task, but Trello is here to help. Life hack: How can you improve your personal productivity and time management? Personal productivity is not an innate skill. You are not born with the burning desire to improve your prioritizing and get things done every day. The most seasoned productivity experts have tried and failed many times before finally unlocking their most effective method for achieving their ultimate time management system. So what’s the key to personal productivity? It’s finding the method that works for you. So whether it’s the Eisenhower Matrix, the Pomodoro technique, a bullet journal, or a different productivity method entirely, understanding different approaches is the first step towards your own personal productivity breakthrough. Once you find the one that clicks—the productivity method that gives you that “A ha!” moment—your productivity will kick into overdrive and you’ll finally find a way to consistently check off all your to-dos, with finesse at that. The right personal productivity apps are here to help you with setting goals (and achieving them!). When leveraged correctly, you will be able to take all the myriad items out of your brain and put them down in a place where they’ll stay until you’re ready to tackle them. 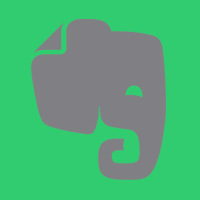 Productivity apps will give you a competitive edge in going from to do to done. 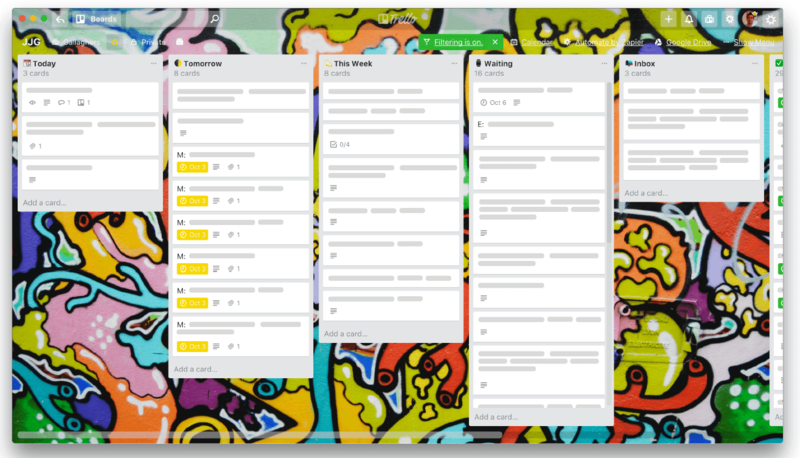 These Trello boards and tips are tried and tested from productivity experts themselves. Check out their methods, then pick the one that speaks to you. Copy their boards and make them your own! Get a realistic and productive look at your to-do list every day with a morning triage system. Set up an automation station to pipe in meeting requests, emails, and chat messages to an Inbox, where you can sort these items alongside other tasks. 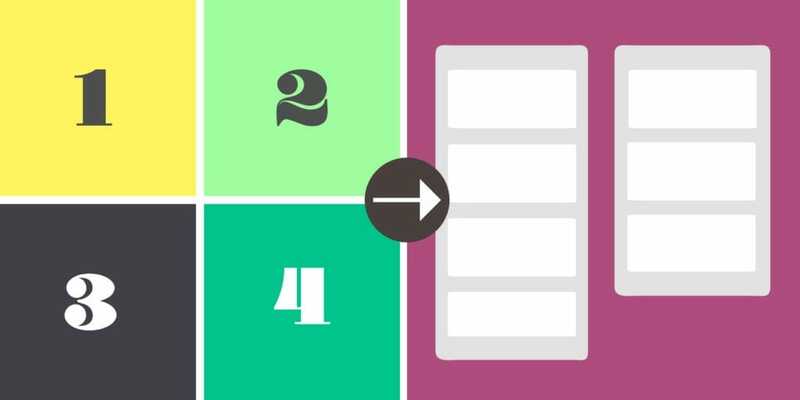 Take advantage of Power-Ups like Card Snooze and Card Repeater to tackle the most important items first without getting bogged down in the details. Helps you focus on your long-term goals by clearing out distracting tasks that keep you from your most important work. 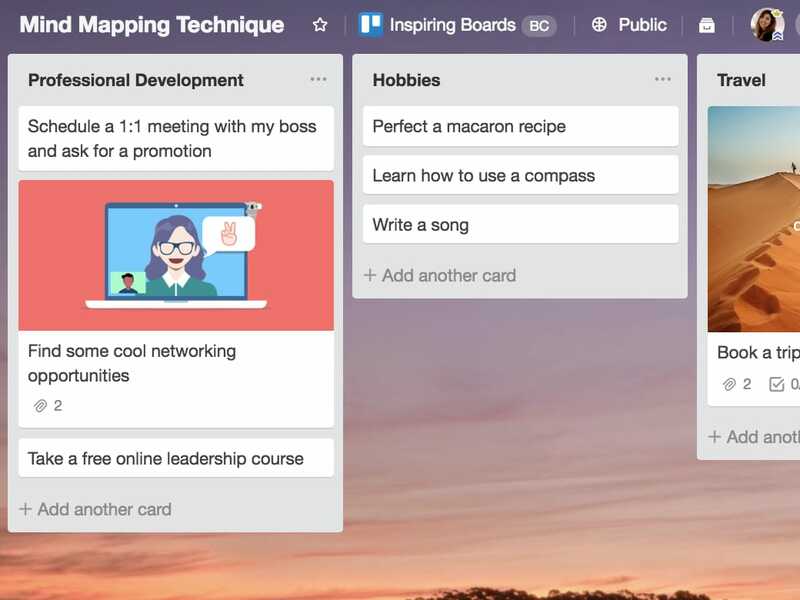 Collaborate with other team members to delegate anything that’s not a top priority, by either adding them to the board or copying those cards to another team board. Use weekly review checklists to stay on track with your most important goals, improve on your mistakes, keep your workload under control, and head into your next workweek with more momentum. Review all your accomplishments, as well as plan out your next week’s biggest tasks, using a simple To-Do, Doing, Done list structure. 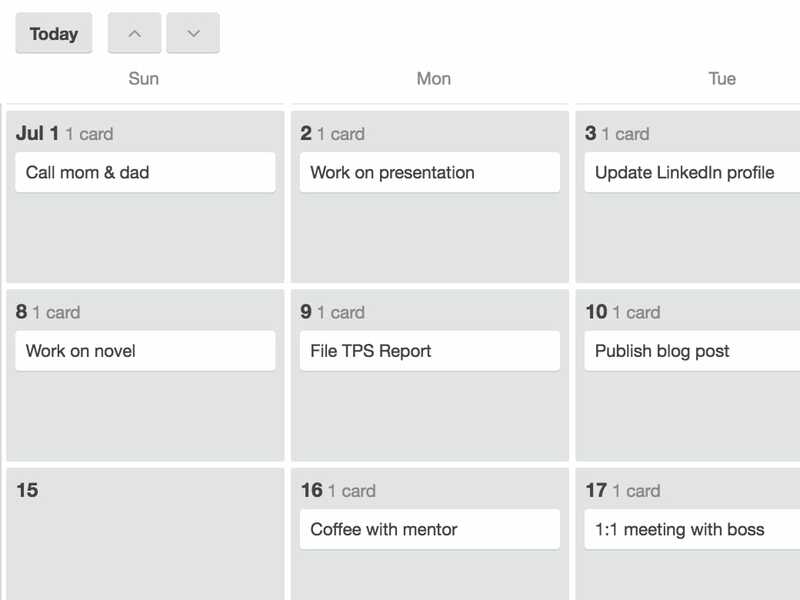 Merge work and life to-dos by also using this review time to meal plan, schedule workouts, etc. Use lists creatively to brainstorm goals, thoughts, and ideas across the different areas in your life with the whole perspective in view. 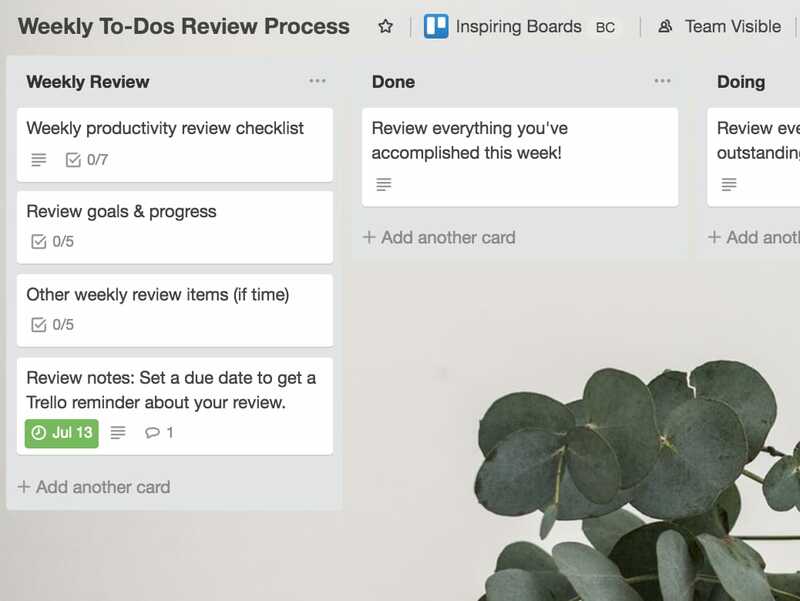 Add images, links, videos, labels, and attach documents to cards using the Evernote or Google Drive Power-Up to enrich each goal with notes and inspiration. Use checklists to break down goals into actionable steps, add due dates if you want to set deadlines, and invite collaborators onto the board if you want to bring on some accountability partners! For a a more free form experience, consider enabling a Power-Up like SmartDraw to create a diagram or draw a mind map right from your board. 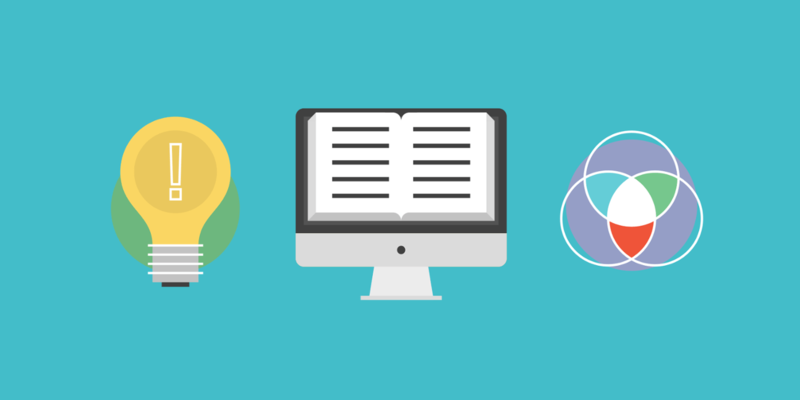 Learn how to boost personal productivity with these free on-demand Trello webinars. Simple, adaptable, customizable. Connect your favorite apps and enable additional features to take your productivity to new heights with Power-Ups. 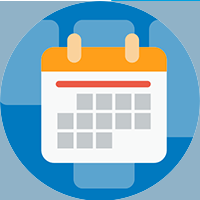 See all of your important due dates within a calendar view, and make managing daily, weekly, and monthly to-dos a cinch. 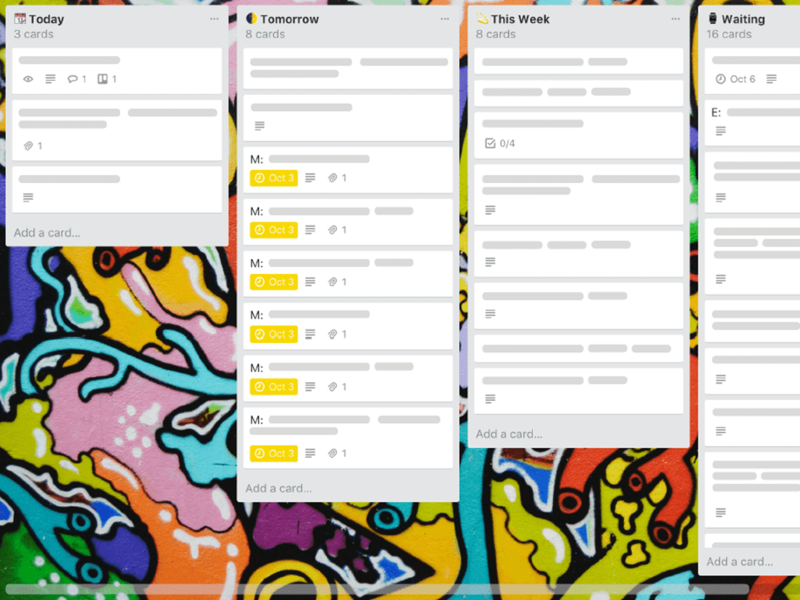 Drag and drop cards on the calendar to automagically update the due dates, like when that thing your boss asked you to finish changes to Wednesday, and now you have Tuesday to work on your soon-to-be bestselling novel. 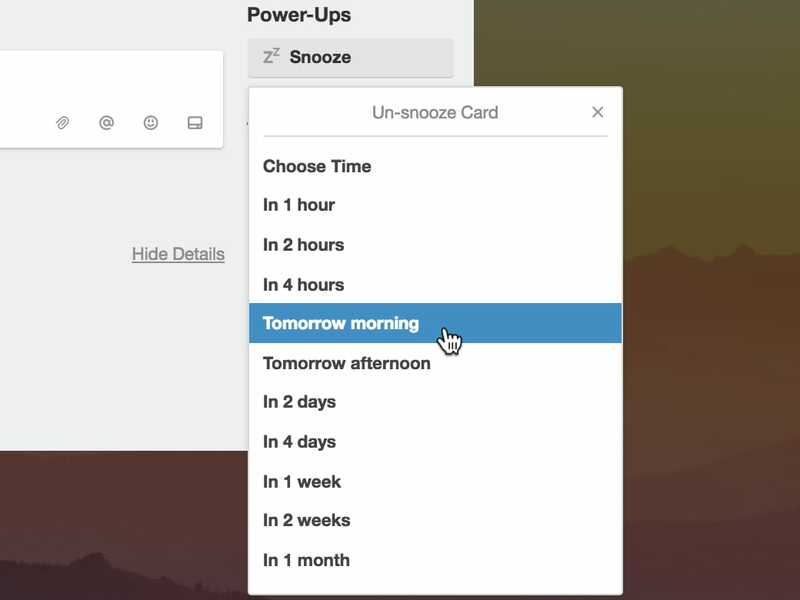 Your favorite alarm clock feature is also available on a Trello board. 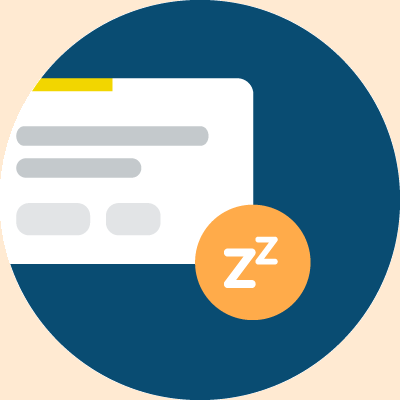 Snooze a card to remove it from view, and the card will return to your board at a set date and time. A great way to remove distractions so that you can focus on the tasks that matter most. 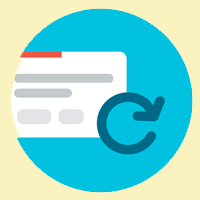 Automate recurring cards and tasks with the Card Repeater Power-Up and give your brain more energy to focus on getting things done. Build a process into your productivity practice so that important reminders and tasks never fall through the cracks. 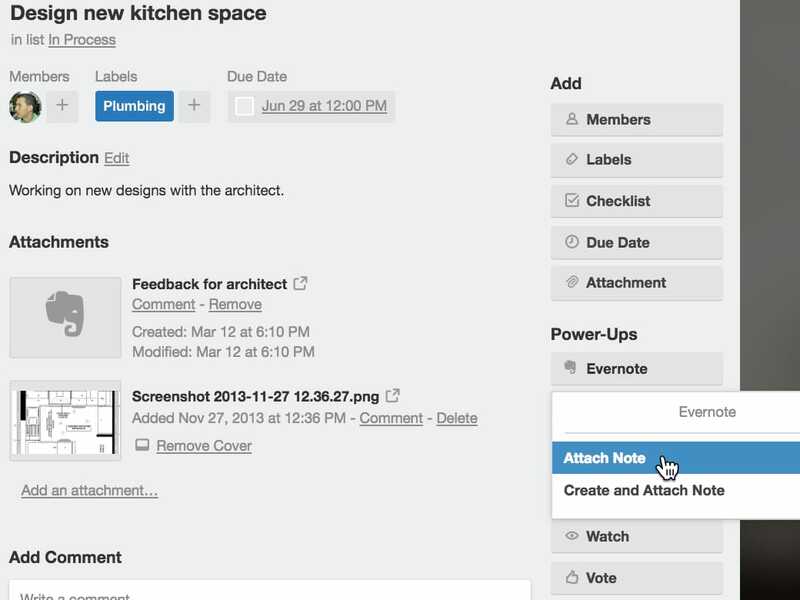 See real time information from Evernote in Trello, like when a note was last edited so you can see if fellow collaborators have updated notes without having to switch apps. 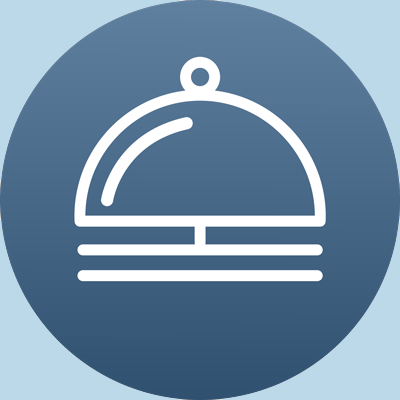 Enjoy the finer things in life, at least your Trello life, with a butler for your boards to do the heavy lifting. 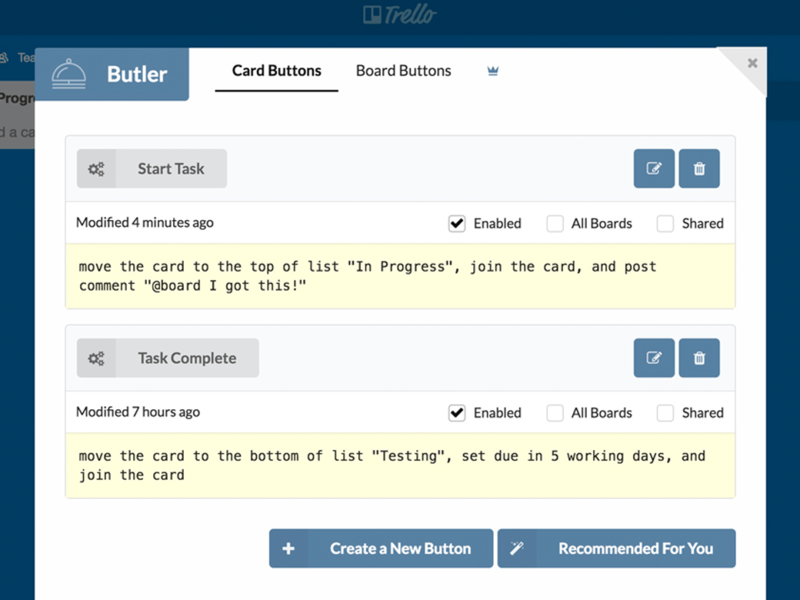 The Butler will even analyze your recent Trello usage history and recommend some automations for your most frequent actions. 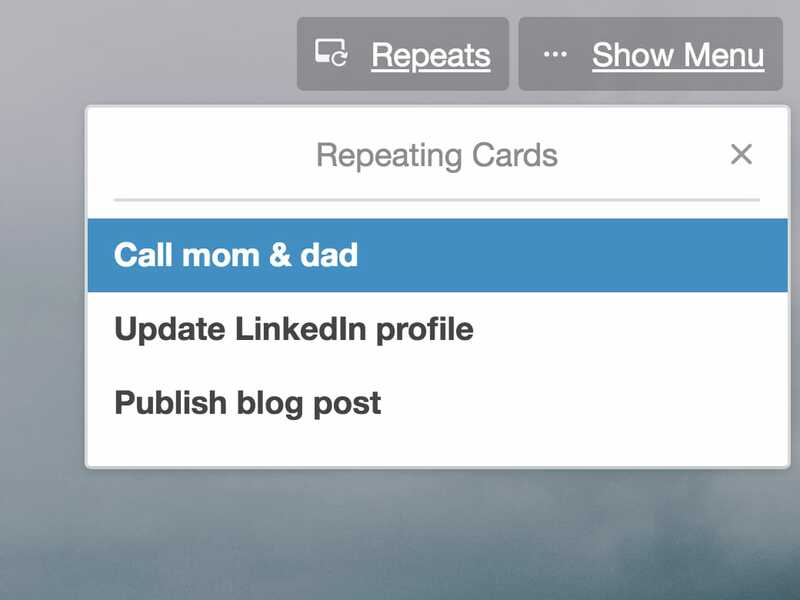 An automation may, for example, set the due date of a card, remove a label, and move the card to another list, all in one click. The possibilities are endless! 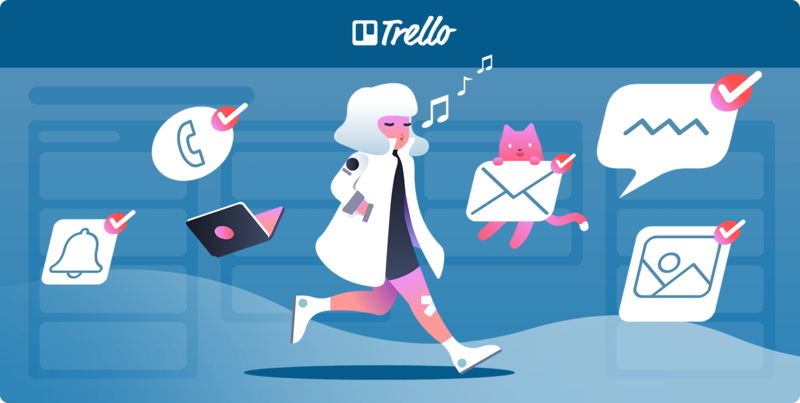 In-depth posts for boosting productivity with Trello from industry leaders and the Trello team. Learn how the original Trello user, Justin Gallagher, uses Trello to increase his personal productivity each week. A task prioritization technique that could be the answer to your overloaded to-do list and notification nightmares. 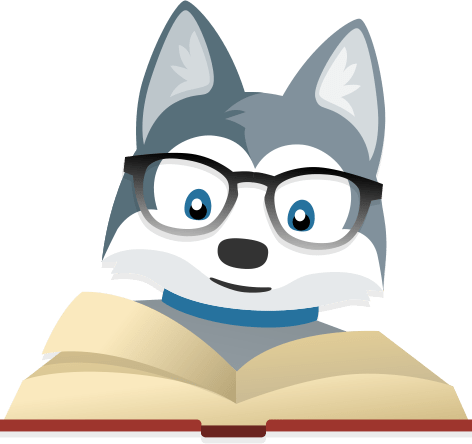 The best tips, tricks, apps & frameworks from leading productivity experts to set goals, manage your time and be more productive. 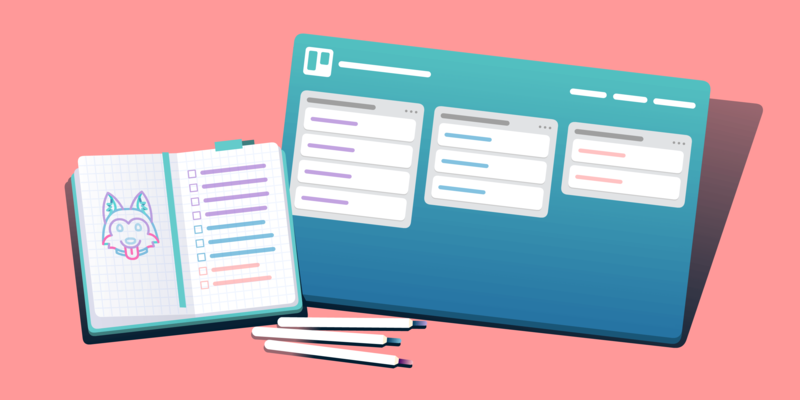 Learn how to transform your bullet journal into an easily accessible and shareable digital tool by using a Trello board.